Richmond Ranch is a Family based operation out of Rumsey AB. 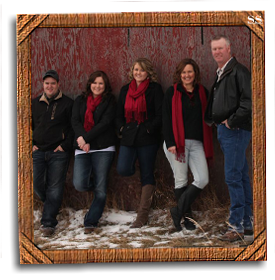 Jim & Stephanie Richmond, alongside daughters Tiffany and Samantha raise purebred Limousin and Angus Cattle. The herd consists of approximately 300 head divided into two groups. 1) The Early Group, calves out in Jan/Feb and the potential sale bulls will then be offered for the Grass Country Bull Sale as performance yearlings. 2) The Late Group, that will calve out in April/May. This herd is made up of TRUE do it themselves Ranch Cows – They Graze in the hills most of the year. They calve on grass in May 2-3 miles from home – (Calving ease and mothering ability are essential). These calves are weaned in December and the cows go back out to the hills to rustle for the winter. The calves are back grounded until May. The potential Bulls for the Grass Country Bull Sale are turned back out on grass until October, when they come in and go on to the same ration as the yearling bulls. These 2yr olds are NEVER offered for sale until the Grass Country Bull Sale. All of the cattle here at Richmond Ranch are raised ranch style for Long term SucceSS. The bulls are fed a good growing ration of silage, chopped hay, and barley at 1% of their body weight. This system allows us to grow the bulls to seek the performance while maintaining their natural muscle shape. Our goal is to not only have bulls looking good for Sale day, but most importantly – looking great working in your pasture during breeding! Over the last 30 years we have been shaping our Limousin herd for SucceSS . Starting with powerful herd sires that stick to the basics of “BEEF” thick & naturally fleshing. Culling strongly for “Do it themselves Ranch cows” that graze the hills and bring in the profits! With strict attention to consistency, fertility, longevity, calving ease, udders, feet & legs, we have reached a point where we feel the herd quality has come together on all ends. We have developed a fabulous set of Working Ranch cows: Fullblood -or- Purebred, Red -or- Black, Polled -or- Horned QUALITY is consistent. All our calves are branded with SS on the Right Hip which has come to symbolize the SucceSS our bulls will bring to your pasture. This brand was Registered in 1943 by Stan Richmond Sr. The Story goes that our ancestors when settling in Canada from England were originally to arrive on the Titanic; but due to logic and reasoning our ancestors felt it was best to have more money to put into the land and the homestead upon arrival that they purchased passage on a boat called the SS Grampian instead. Call it luck or fate it is the story of our heritage and it is with great pride we brand all our Calves with our stamp of SucceSS. Our Moto is "Satisfaction Fully Guaranteed: a satisfied customer is our number 1 priority!" We are thrilled with the SucceSS of the Grass Country Bull Sale and are confident that the powerful genetics that raised the Grass Country Cattle will work great in YOUR herd. TRIED TESTED & TRUE!! DISPOSITION MATTERS! We at Richmond Ranch take pride in Specializing in Quiet Cattle. They say a picture speaks a 1000 words … Enlarge the image to the left and see what these pictures have to say about the disposition of Richmond Cattle.